Big change can lead to a certain amount of confusion. As we’ve seen in the world of Workamping, this is true to some extent as it relates to the questions of “who” and “what” is now considered Workamping. In today’s world, Workamping can be quite inclusive. 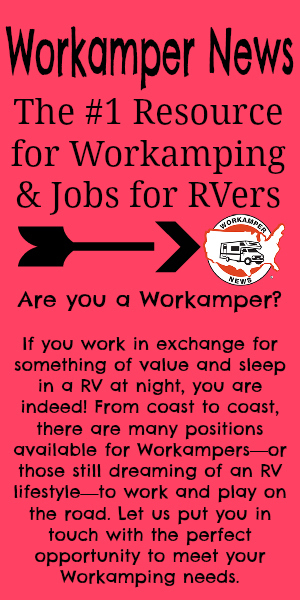 The definition states that as long s you are working while living in an RV, then you are a Workamper. As we see more and more RVers take their businesses with them or find alternative ways to make money while they travel, this widens the definition to include a broad spectrum of people beyond those just employed in the outdoor hospitality industry. For this reason, I find it easier to break Workamping down into categories that make conversations easier to follow, and also to help others better understand the opportunities encountered through advertisements. I like to think of Workamping in categories of: Seasonal Job, Location Independent Jobs, Small Business RVers, and Traditional Jobs. The majority of Workamping job opportunities fit into this category, as it was the initial start of the niche. Seasonal jobs are those that greatly benefit the Workampers and the Employers by providing a compromise on benefits. The Employers are able to hire the exact number of staff members they need for a particular time period (which is usually their busy season), and then have them leave when they are no longer needed (when business slows down). This arrangement also works well for the Workampers! They are able to accept employment for a set time period – most notably during the summer camping season – and work for that time frame while exploring the local area. Then they move on to a new destination once the job is complete! Seasonal Jobs are also the easiest type of Workamping jobs to find and acquire. Workamper News magazine is filled with advertising from Employers who seek Workampers to enjoy their properties during the high season in some of the most beautiful areas of the country. The majority of these jobs will be centered in the outdoor hospitality industry, which makes sense for RVers! Seasonal Jobs could include a variety of positions at places like due ranches, public and private campgrounds, resorts, national parks, theme parks, historical preserves, and even fish hatcheries. The opportunities seem endless and jobs are bountiful. A new catchy type of of job category we’ve seen spike in recent years – thanks to the hipster movement and love of mobile technology – is Location Independent. What that means is that you can work from anywhere! As you can imagine, this a very attractive benefit and many people who set to travel dream of following their nomadic spirit, allowing them to wander freely from place to place, working along the way without the ties of staying in any location due to work constraints. They work wherever the road leads and whenever they are not exploring the surrounding area. These people, also labeled digital nomads, take the travel life to a new level without the need to agree upon staying specific dates in one location. While Location Independent jobs are all the rave on social media right now, they can be more difficult to secure if you do not have a background in technology, sales, and sometimes even customer service. These positions can vary from a range of tech careers to customer service reps, and even sales positions like working for direct sales companies. One of the best ways to hit the road with little to no strings attached is to own and operate your own small business from the comfort of your RV. Small Business owners across the country are finding that RV life affords them the comforts of home, a stable office environment, and the freedom to roll wherever the road leads! Running a Small Business is hard work, but can be a very rewarding career strategy for those who have the entrepreneurial spirit and the drive to make it all happen. Small Business RVers have the best of both worlds – they own and operate their own business with all the tax benefits and freedom to make decisions as they see fit, along with the ability to travel wherever they please in their home on wheels! Running a small business from your RV can include just about any business type, or hobby for that matter, that you are able to generate an income stream from. Some folks start with a hobby they love and turn it into a revenue stream after investing some time and energy to build a client/customer list that can sustain them as they travel. Others find it easier to start a Small Business and build it around the direct sales or affiliate marketing concepts. When I speak of Traditional Jobs, I’m referring to jobs for companies that do not offer a campsite or make any reference to hiring Workampers in their advertisements or recruiting strategies. These companies generally are just looking to hire seasonal employees, usually from the local employment pool, and have no interest in how or where you might reside. Traditional Jobs can include position in retail, customer service, maintenance, positions with tech companies or call centers, and anything else you can dream of. The only way they fit into the conversation of Workamping is that you are living in an RV while you work. This type of Workamping usually requires you to stay long-term in one location and y our RV would be stationary for the most part. Regardless of where you are in the country and what you might be doing, consider the possibilities what Workamping has afforded you and will continue to afford you farther down the road. If you are not yet traveling and still planning your big adventure, consider the freedom that Workamping will allow you. Having an open mind is the key to success. Do not limit yourself to one type of job, one location, or one employer for that matter. Workamping is so much more than that! Open your eyes to the vast amount of possibilities that have now become opportunities!